** Drop Off ** Let us wash and fold for you! Our goal at The Laundry Barn is to provide you with a friendly, safe, affordable and clean atmosphere to do your laundry. We are located one block north of Blue Starr Drive on Lynn Riggs Blvd (Highway 66). 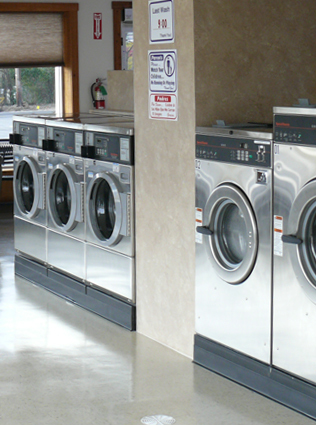 We offer the best quality self-serve washers and dryers, as well as drop off laundry service with quick turn-around times to meet your busy lifestyles. Drop off your dry cleaning and we will return it promptly. We also have a pickup service for your convenience. Schedule a pickup and we will come to you! The average person spends approximately 8 hours per week doing laundry at home. Laundry Barn customers have access to 60lb washers and 75lb dryers drastically reducing the time to as little as one and a half hours per week! Our energy efficient, top of the line Speed Queen machines are the best in the industry and can handle small to extra large loads of laundry. Make your life easier with our convenient pickup and drop-off service. 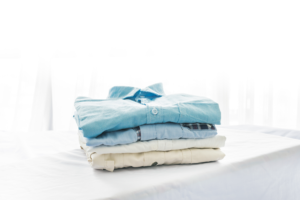 We will wash, dry & fold your laundry – you just leave it and retrieve it! Our hands-free electric sliding door allows you to enter/exit with ease. We are the first Quantum Gold Speed Queen laundry in Oklahoma.